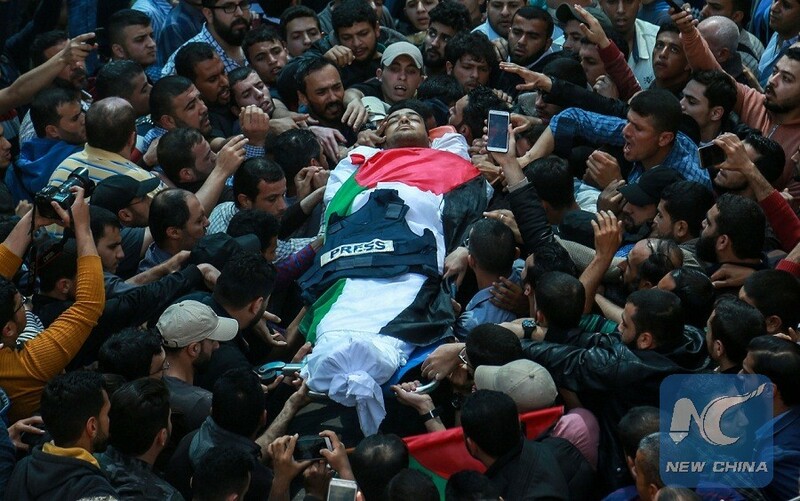 GAZA, April 7 (Xinhua) -- Dozens of Palestinian journalists joined Saturday the funeral of their colleague, who was shot dead while covering clashes between Palestinian demonstrators and Israeli soldiers in eastern Gaza Strip on Friday. Yasser Murtaga, a 30-year-old cameraman from Gaza city, was shot in his abdomen on Friday afternoon east of the southern Gaza Strip town of Khan Younis while he was filming for a local Gaza news and TV production company Ein Media. Yasser's mother said his dream was "to film the ground from an airplane," adding with tear that "his soul is in the air and his dream comes true." The Palestinian journalists union condemned in an official statement the killing of Murtaga while working, with his helmet and protection jacket on. The jacket has the the word "Press" on its chest and back. "This is clear evidence that the Israeli soldiers are directly targeting Palestinian journalists," said the statement, who called on the International Federation of journalists and rights groups to investigate the "crime." Ashraf al-Qedra, spokesman of the Gaza Health Ministry said on telephone that the Israeli occupation forces opened fire directly at Palestinian journalists, killing Murtaga and wounding eight others with live ammunition and rubber bullets. Murtaga died after midnight of his wounds he sustained from Friday afternoon. Al-Qedra said that he was shot in the abdomen by a live gunshot that infiltrates into the body and explodes inside. Murtaga got married in 2014 and he has one son. He studied at Gaza Islamic University and became the founder of Ein Media for TV and Media production in Gaza. Over the past seven years, he produced several short and long documentary films together with editors and producers at the company. Two days before Murtaga was killed, he wrote a post on his Facebook account that he has never been out of the Gaza Strip and his dream is to travel and wander around the world. He failed several times to travel without getting an Israeli permission. The Palestinian government press office in Gaza also condemned in a statement the killing of Murtaga and the direct shooting at Palestinian journalists while they were covering the rallies, which began on March 30 and will end on May 15. During Murtaga's funeral, Shadi al-Assar, a Palestinian freelance photojournalist and Muraga's friend, said doctors told him that Muraga was bleeding a lot inside on the way to the hospital. "Apparently it was a new kind of gunshots that explode into the body and cause internal bleeding," he added. Al-Qedra confirmed that nine Palestinians, including Murtaga, were shot dead by Israeli snipers' gunfire, besides one died of wounds sustained from last Friday, adding that around 2,850 were injured, including 1,296 by live ammunition and rubber bullets. Six of the killed were buried on Friday afternoon and evening, and four were buried today in the Gaza City, Nuseirat in central Gaza Strip and Rafah in southern Gaza Strip. Hospitals are still treating the casualties who were shot and wounded Friday.